Over the past few years I have been a staunch supporter of NCAA Football over Madden NFL. EA Sports has truly dropped the ball on both games in multiple ways over this entire generation of consoles (PS3 and 360). Many can blame the glitches and problems on the apparent dependency that developers have on releasing software updates and patches through online interactions. While these kind of ‘hot fixes’ are vital to software (including games) it seems to have left the door open to sloppy development over the course of a year. This isn’t even the biggest problem facing EA’s NCAA Football at this point – it is the college football landscape itself. Bye Bye BCS… Hello new broken game development. In case you haven’t paid any attention to college sports over the last few years, there have been teams moving from conference to conference more than Bobby Petrino switches teams (and women). On top of conference changes and re-alignments, the NCAA has recently approved the move to a new playoff system (finally). This is welcome news to the people that still pay attention to the NFL’s minor league affiliate, but for gaming fans it is a dreaded issue that is too far into the future to allow them any sort of desire to want to invest in more broken games without any sort of tournament or playoff system for college football gaming. Why waste time and money on a game that changes faces so often? College football is a joke in many ways but when it comes to the hypocritical billion dollar deals for the services of ‘amateur’ athletes with coaches that make millions of dollars a year over networks like ESPN – why is it that the gaming end of things is so strangely broken as well? College football is a farce and NCAA Football is a digital farce that continues the NCAA’s views that making money off of college football is paramount. The broken BCS system is just as broken in the video game as it is in real life but now there are gamers clamoring for something worse than fixing issues that plague a game… they want options. Gamers want to edit players, names, conferences, polls, ranking calculations, awards, coaches, CPU intelligence and many other facets of their game. This is all simply because that whenever EA Sports slaps together their annual sports titles they are constantly closing off customization more than opening it to users for a better experience. Maybe they should take a look at how much games like Counter-Strike can become huge in the PC market – all because of modders and an active user base. NCAA Football 13 went from $60 to $45 rather quickly this year. It was as if it was a hyped up movie that hit theaters for a week before going to DVD and your local Big Lots bargain bin. EA Sports has proven over this generation of consoles that there is no level too low for them to stoop in terms of laziness and development to keep your money coming in with their effort consistently falling. This isn’t to say that Madden NFL doesn’t have issues mind you (we will hit that later) – but with the NCAA season coming to a close and many college football fans looking to next year we must wonder – what is EA going to do in NCAA 14 that will keep gamers from thinking “I’ll just wait until next year – if at all.”? Let the 2K College Football rumors begin. Now that Madden 13 finally has the patches needed to make it a truly complete game we can start talking more about how to approach different modes. In the case of Connected Careers Mode there are numerous ways to approach how to build your team as a coach. Building your team starts with getting the right pieces in place. I started a career with the Kansas City Chiefs and somehow took them to a Super Bowl victory with Romeo Crennel in my single player Online Franchise ‘Romeo’s Thinkin’ Arbys’. After winning the big game in my first season I wanted to move on with a new coach in a new (and more challenging) situation. Naturally, I went with the Browns and started my first off-season by trying to get players to fulfill stop-gap roles for my first season. Then finally, I got to the draft… aka – the best part of building your team. It is more than simply taking the best-available player. You need to consider what your team truly needs when you start drafting players. This includes scouting during the season as well. As a coach, you will need to pay close attention to the contract statuses of your players and how they are performing for you. Taking a Quarterback when you really need a Defensive End or Linebacker could make your team suffer. In this same breath, you should also compare the players by their ratings and their size. Also, if you want a cheap way to scout for players that will be highly rated on your team, make sure you spend the 25 scouting points on ‘Scheme’. This will be something you can use as you go through the year to set up your potential draft picks. Over the course of my current CCM I have come across a few free agents that intrigued me. The best pick-up I have made is WR, Leonard Hankerson for the Browns in 2013. He came in as a replacement for my injured rookie WR and ended up leading the team in receiving yards, TDs and got himself a huge contract in the off-season. Keep your eyes open for players that perform well when playiing for you. Sometimes a player might not be ‘a good fit’ but he could end up becoming exactly what you need to turn things around. One of the hardest things to do in sports games is to part with players that you either like in real-life or simply want to develop in the game. Some of them just don’t pan out or under-perform over the course of time. You have to make those tough decisions and understand that the betterment of your team is the long-term goal. 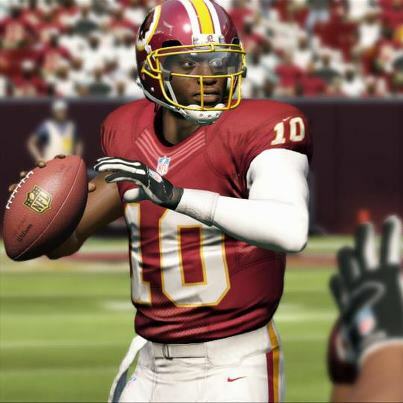 One of the parts of CCM in Madden 13 is progressing players based on their performance on the field. Make it your mission to look at the goals being set for all of your starters and try to develop your players through that system. Once again, EA Sports has released their list of the Top 10 ‘skill’ position players – this time it is the Running Backs. Even with a torn knee ligament – Adrian Peterson is towards the top of Madden’s HB list. One of the main issues with the ratings in Madden is the fact that one of the top running backs in the league (Chris Johnson of the Titans) isn’t in the Top 10. He had a poor year in 2011, sure. On the other hand, he didn’t suffer any injury that would make him actually lose out on how good he is/could be. On the other hand, players like Adrian Peterson and Jamaal Charles both suffered terrible injuries to their knees and are still rated as Top 10 Players. It can be argued both ways, but Madden’s newest direction for rating players through a community vote for a few specific ratings is one of the more laughable developments in their new marketing direction. Hopefully they open up player edits for Connected Careers with a title update. If not, it looks like Madden 13 will be one of those games that makes you tilt your head to the side and wonder what the heck they are thinking with their ratings. Outside of the fact that it blows a player up to be the ‘best’ in the game, it is a rating that is comprised of a formula that brings into account the different skills that are necessary for each given position. There are also ratings that have no effect on gameplay (Awareness) and then there are ratings that should play a greater role that don’t at all – such as Injury and Toughness. A durable player is one of the more valuable assets in football, no matter which level you are playing. Yet, in Madden and NCAA these ratings mean nothing when it comes to the Overall value of each player? A player’s value should also be dictated in career modes by their production. Notice, we didn’t say their ‘Overall’ rating, rather their ‘Value’ which is also a rating that doesn’t matter or in this case – exist. A player might not be the most physically talented or even have a dominating presence on the field but if they consistently lead their team to a Super Bowl or maybe even lead the league statistically chances are good that they will either demand or command a big pay raise and more respect as a player. A prime example of a player like this is Joe Montana. Joe Montana wouldn’t be in our subjective Top 10 for throwing power or speed, but he would have a high rating for Toughness, Throwing Accuracy for short and medium range passes, etc. He was a super-skinny player that wasn’t a physical specimen like Cam Newton but he was a winner and arguably the best Quarterback of all time (again, our subjective opinion). How do you feel about ratings? Are we blowing this out of proportion or is this getting downright silly to you too? Just in case you are still on the fence about whether or not to buy Madden 13, you should consider it one of the safer sports titles to bet on this year. The problem that most people face when it comes to buying a sports game is that they are usually just a roster update with some sort of half-cocked mode enhancement like ‘Mascot Mode’ (see NCAA Football). Madden 13’s Connected Careers could be the mode that finally turns the game into a new direction… maybe even the right one. When you retire as a real player (Tebow or RG3) they won’t be out of the league you will just not control them anymore. While Madden has a tendency to suffer from playing like a glorified arcade game in the guise of a simulation football title, it also has the benefit of consistency in gameplay. In other words – we usually know what to expect when it comes to Madden and how it will play. Player movement is something that hasn’t really changed in Madden since the PS2/XBox generation – especially when compared to titles that were competing with Madden. On the flipside – Career modes have suffered in Madden for years. Madden 12 saw one of the biggest jumps in quality of Franchise Mode since Madden 05 (arguably the best Madden to date). This mode still lacked any real sort of ‘stand-alone’ quality that would keep the end-user from wanting to take control of editing players or simply controlling all 32 teams in order to make the mode feel more organic – ironic, but true. Connected Careers is designed to bring Franchise Mode and Superstar Mode (where you control a specific player) together as one. You will be able to control a player or a team (as the Coach). Some gamers are going to relish the chance to play as a specific player. However, the real depth is going to come from being a Coach. 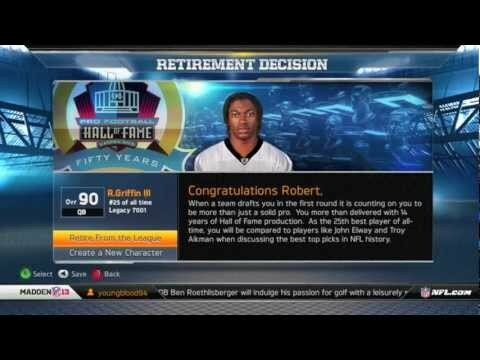 One of the more annoying parts of Madden 11 and 12’s Franchise Mode was the concept of ‘Potential’ ratings for players. What made this so frustrating was that you could take a player like Derek Anderson and make him into (statistically) the best QB in the league but his OVR (and therefore, his value) would not increase. Imagine Kurt Warner winning the Super Bowl with the Rams but never considered to be ‘great’ – that is what the potential rating did to Franchise Mode… it took away the feel that your players were any good unless they had a great potential rating. This year, Potential Rating is gone. You have to earn XP for each player like in a Role Playing Game. So, if you want to make Brady Quinn or Derek Anderson your starting QB and develop them into a 99 OVR player – you can. The crux… you have to earn it. There are going to be some fun developments when people start making Connected Careers ‘their own’. As Madden 13 gets closer, there will be more details coming out of the woodwork. The real details that people will notice are the glitches in the game after it comes out. There are bound to be some things that happen in Madden 13 that make people cry foul and say that the game is broken. It happens every year and this year won’t be any different – Madden 13 will have some things that need to be patched (fixed via an update). Connected Careers will probably have some things that need to be tweaked and the one thing to hope for is that when these issues pop up you won’t have to restart your CCM. Keep your eyes and ears open, your hopes up and you expectations grounded. Madden 13 is almost here. How Should Sports Games Reflect The Happenings of Real Life? Today the NCAA decided to pass down a punishment on Penn State that would essentially cripple the football team and university for years. It does raise a question about how much video games should or shouldn’t reflect what happens in real life. For instance, in NCAA 11 and 12 you will notice that teams like USC and Ohio State are given terrible ratings as far as Championship Caliber and Coach Ratings matching those of Luke Fickell (eventhough they aren’t really those coaches… riiiight). When game developers gloss over the realities of the sports they are trying to reproduce they are short-changing their creativity and the consumer’s ability to take part in a true simulation of the sport itself. Now we are in the midst of a USC team coming off of a ban, an Ohio State team starting a one year ban and last but not least – Penn State. In NCAA Football 06 you would have to deal with players violating team rules and all sorts of things that brought real life situations to the game. Why have these things been taken out of games this generation? Madden NFL Football doesn’t have late hits, real-time injuries or even contract holdouts. Are sports games being held to a different standard somehow? We have shooter games that allow for some of the most gruesome actions to take place but when it comes to sports titles we can’t have late hits or concussions? We can’t have bowl bans or shady recruiting? We can’t have team rules violations by players that have questionable motivations? You can’t say we never had these things before… we did… but now they are gone with the winds of political correctness or some sort of false societal demands. Author NoobTubeTVPosted on July 23, 2012 July 23, 2012 Categories Gaming Blogs, News, Reading, SuggestionsTags 2K8, APF, APF 2k8, Call of Duty, Jerry Sandusky, Joe Pa, Joe Paterno, Madden, Madden 13, Madden 14, NCAA Football, Penn State, Penn State Ban, Penn State Punishment, PSU, ShooterLeave a comment on How Should Sports Games Reflect The Happenings of Real Life?